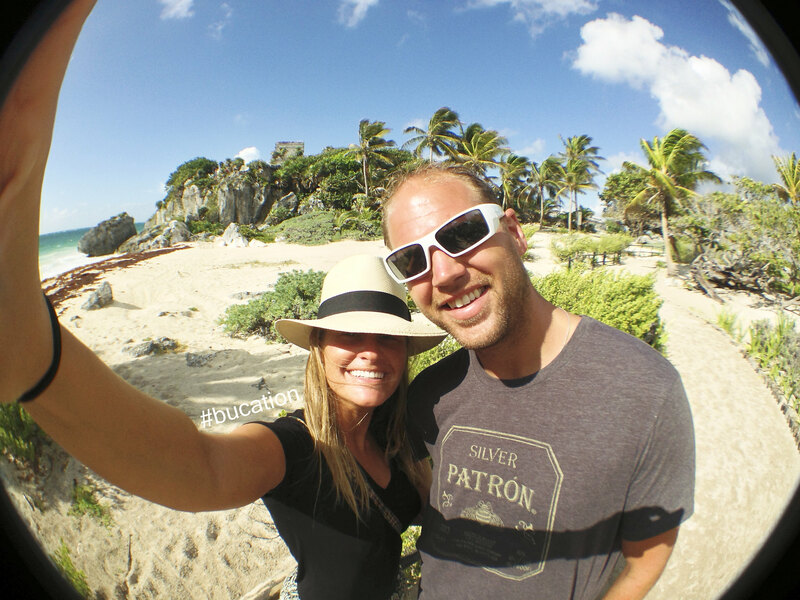 Tulum isn’t your typical vacation destination; at least, it was unlike any place we’ve visited in our travels thus far. It is here, where the beach meets the jungle, that we found paradise. If you told us you were looking for somewhere to get lost in exploration, escape reality, and go completely “off the grid” (in style) – our response would be Tulum. The telephone and internet services are about as reliable as a sundial at midnight. Pack your pesos instead of relying on the plastic we’ve all come so accustomed to (over) swiping. Along with the internet, Tulum’s communications with the outside world – including its bank and credit card services – comes and goes like the rolling storm clouds that quickly move through its beaches. Their telephone and internet signals come and go with the weather, and like everything else – there are good days and bad. For some of us, this detachment from the real world is a blessing. In Tulum, you will find yourself 100% “out of office.” For others who have become technologically-dependent, this could be a shock to the system. Without a direct line to civilization, you will find yourself surrendering to Tulum’s relaxed culture – spending less time connected with the outside world and more time connecting with yourself, your traveling companion(s), and your new surroundings. No stamps in our passports have lead us to somewhere as laid back and yet so environmentally aware. 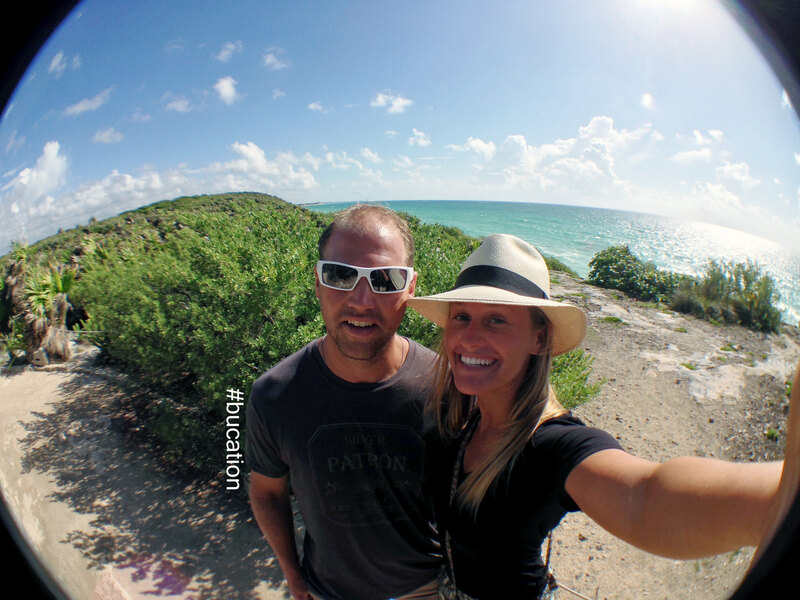 The culture of Tulum is so relaxed, but yet so in tune with their impact on our planet. Many establishments generate their own electricity through wind or solar panels, collect rain water as their primary water source, and are free of all the modern conveniences we have become accustomed to as Americans. A number of restaurants and hotels do not offer air conditioning, telephones, televisions, or internet access. This may be a deal breaker, but for us Tulum truly feels like an escape. 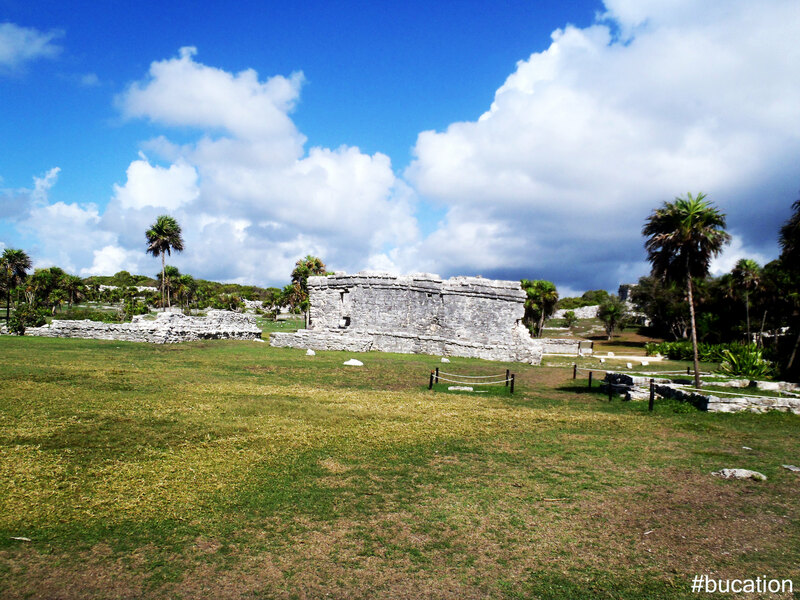 Although there are a number of historic sites throughout Mexico, none are quite like Tulum. From the minute you pass through the preserved limestone walls of this Mayan city by the sea, this picturesque archaeological site will no doubt take your breathe away. 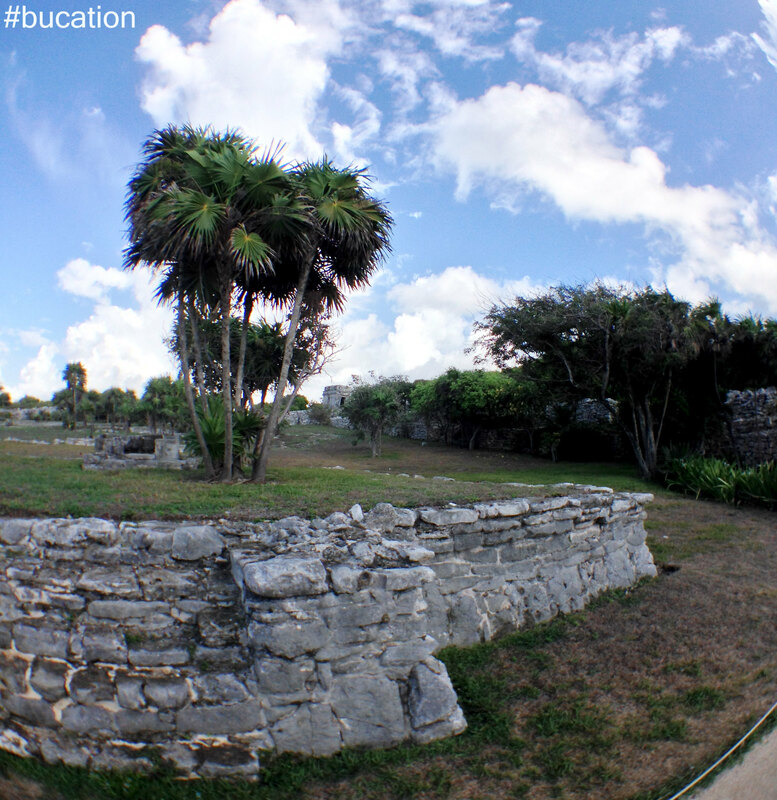 In our opinion, this ancient Mayan fortress is a must visit on your next trip to the Yucatan Peninsula. Guided tours are available for an additional fee, however we prefer to wander through the ruins at our own pace. This allowed us ample time for photographs and uninterrupted exploration. The Mayan city of Tulum was built on the eastern coast of Mexico’s Yucatan Peninsula along the Caribbean Sea as a seaport in the late thirteenth century. 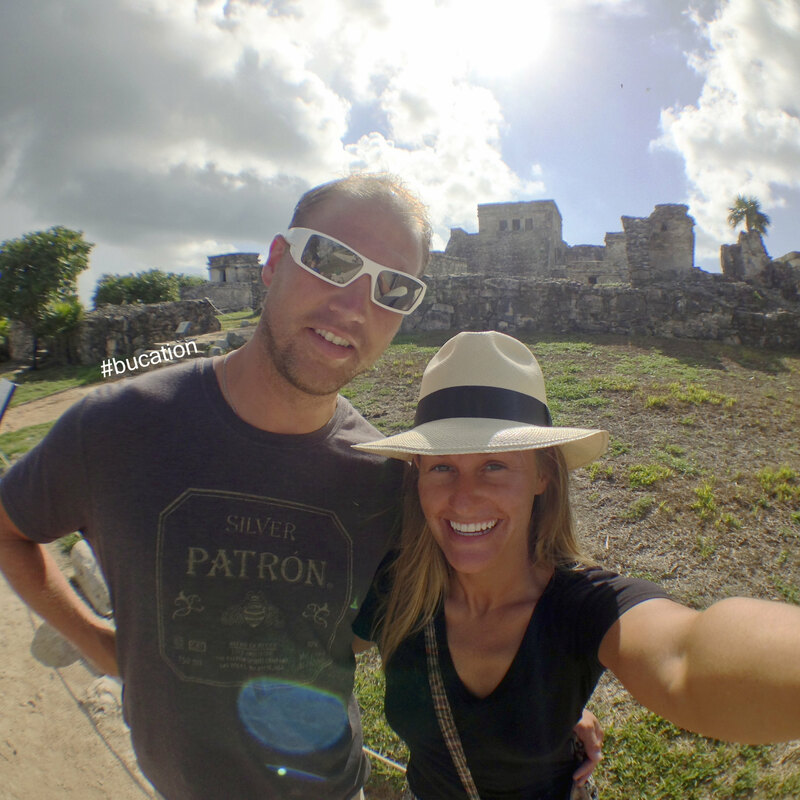 The name Tulum means “wall” in Yucatec as it truly is a walled city. It is reinforced on three sides by an impressive limestone wall which stands between ten to sixteen feet high. As you stand before the settlement’s massive walls, you begin to realize the amount of importance that Tulum’s residents placed on security for these surely took time to construct. As we passed through the city’s limestone walls and step into the pages of an issue of National Geographic, it was as if we had traveled back in time. 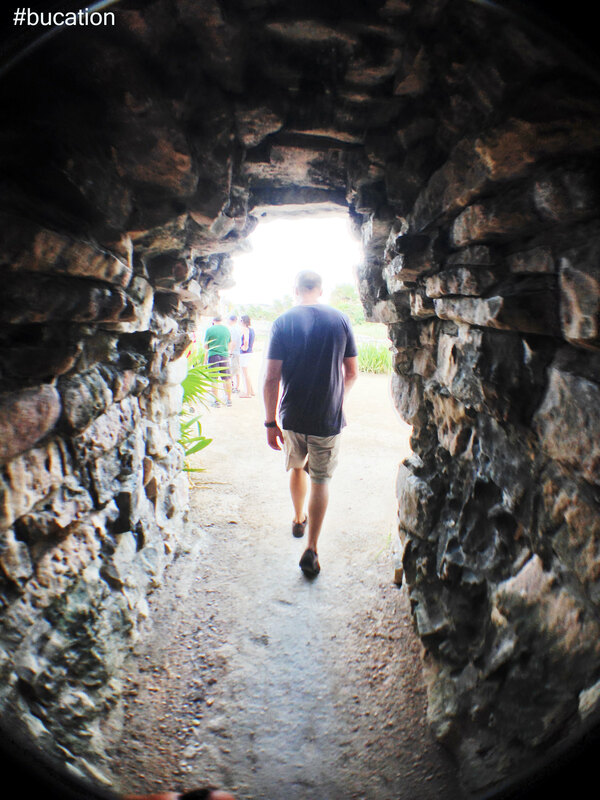 These narrow passageways surround you in complete darkness at some points, but there is a light at the end of the tunnel as the passage opened and we finally caught a glimpse of the awe-inspiring city of Tulum. 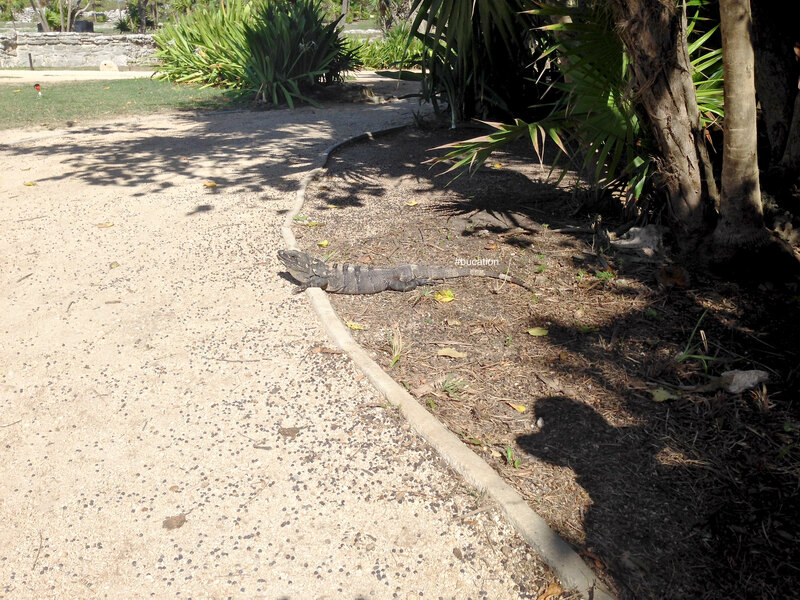 The beautiful grounds of Tulum are perfectly manicured, and if you are lucky you will catch a number of iguanas sunbathing throughout the site. There are a number of ancient structures that are still visible throughout the site today. Of the ruins that remain intact to this date, the Pyramid El Castillo was the most impressive structure to us. This twenty-five foot castle by the sea sits high atop the city’s fourth wall which is a set of spectacularly steep and treacherous limestone cliffs. El Castillo overlooks the mesmerizing turquoise blue waters and white sand beaches below. As you take in the view of the cliffs below, there appears to be a small cove at a break in the cliffs where trading may have taken place by boat a thousand years ago. It is at the top of these massive cliffs, nearest the Pyramid El Castillo, where you will find perhaps the most picturesque views of the Caribbean Sea and a good portion of the Riviera Maya. The stunning views of the site’s lush landscape along with the remains of this ancient castle positioned high above the Caribbean’s white sand beaches are unforgettable. 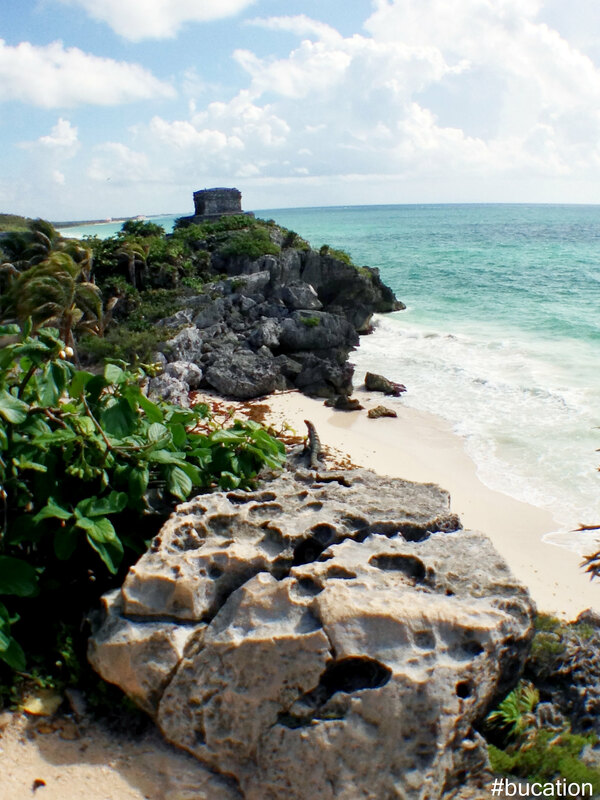 This lookout is also a favorite site of the Tulum’s resident iguanas as well. Here you will find a number of iguanas carelessly basking in the sun while the waves of the Caribbean Sea crash into the cliffs below. 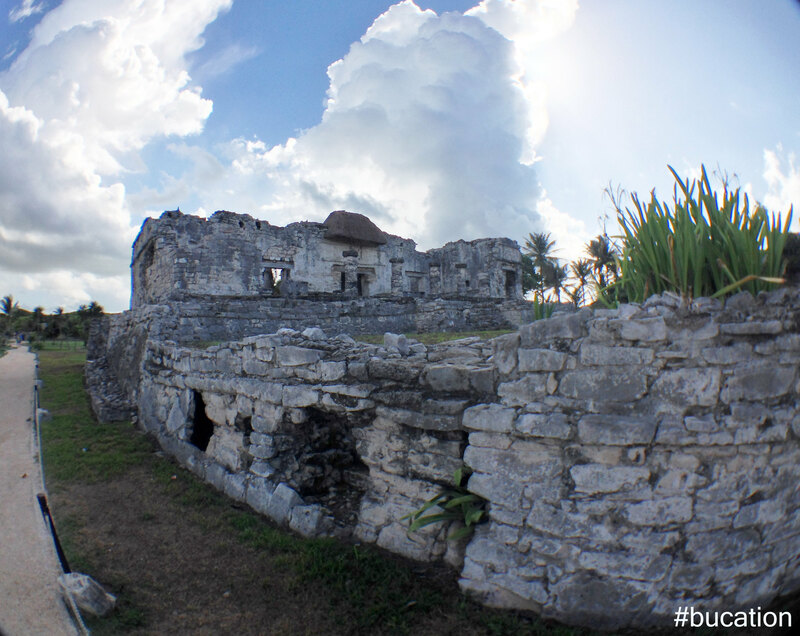 Aside from the incredible views of the Caribbean, the Pyramid El Castillo also served a very important role in Tulum’s trading history. During the evening hours when their path in the sea was not visible, El Castillo was used as an ancient lighthouse to guide traders safely through the sharp cliffs below by using the various windows in the shrine. The corresponding windows were lit as each area became more navigable to the boats below. 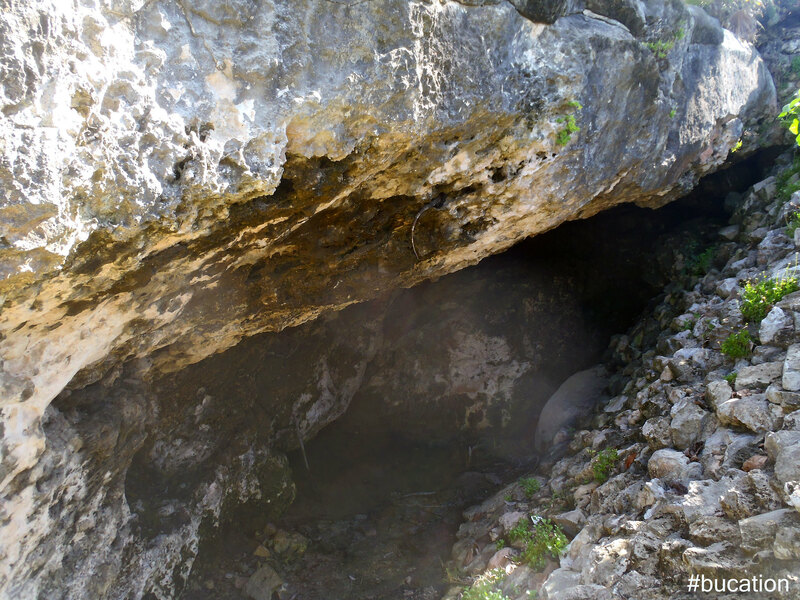 Incredible discoveries like these are rampant throughout the Tulum ruins and we don’t want to give away all of its ancient secrets, so plan your trip now if you want to know more. The Mayan city of Tulum is not as large as other Mayan sites in the Yucatan, but it is certainly one of the most well preserved and picturesque. A visit to this magical Mayan city on the Caribbean Coast will have you feeling like Indiana Jones. 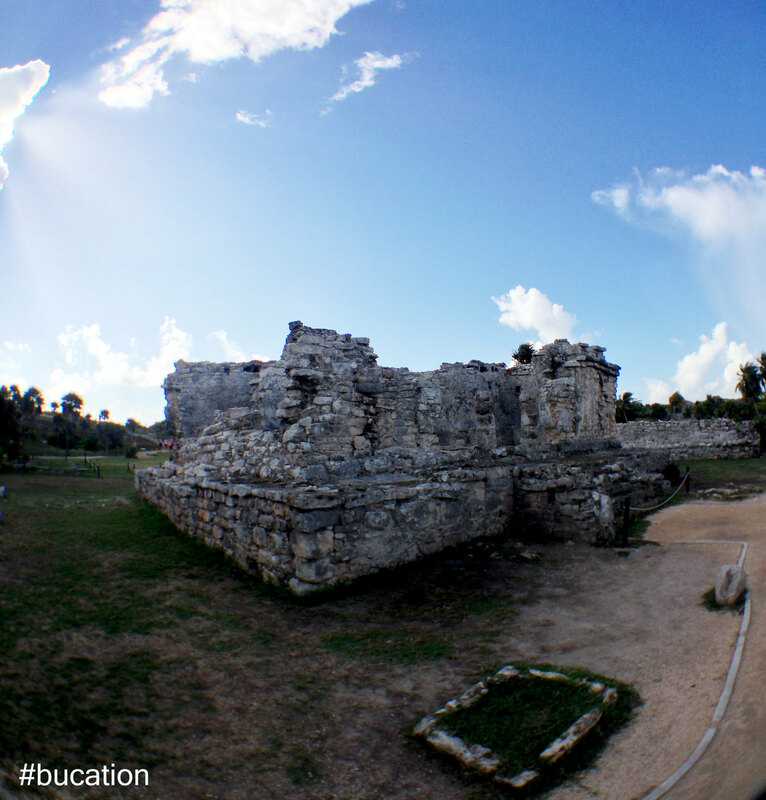 As you explore the ancient ruins of Tulum, you will begin to see what a true treasure Tulum is. 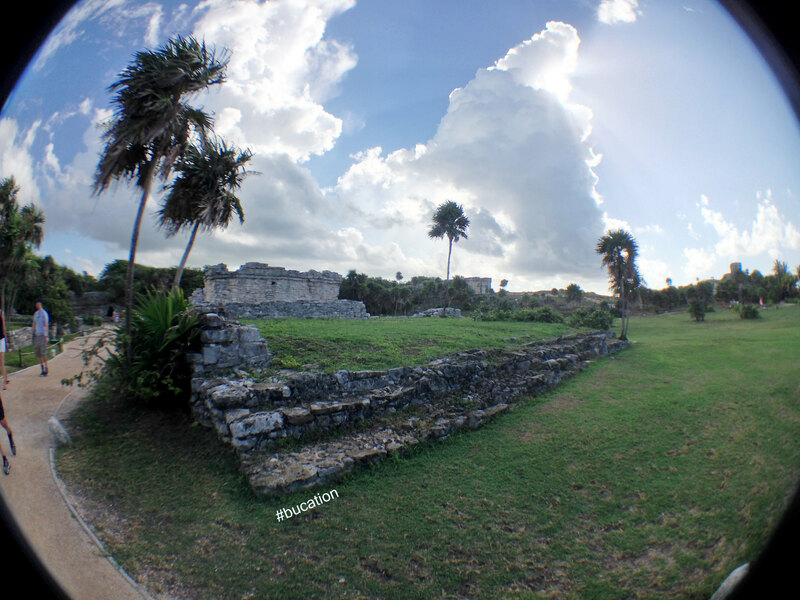 Although you are not able to climb the ruins themselves, the trail paths do allow you to get up close and personal with the amazing craftsmanship that went into building this Mayan city by the sea. Arrive early, before the tour groups. This will allow you to get close to the ruins, and enjoy the famous beach before the throngs of tourists takeover. Don’t forget to bring pesos for admission, parking, tours, and craft souvenirs which can only be purchased in local currency. Stay hydrated, and bring a bottle of water or two along for the adventure. Bring your swimsuit along on your tour of the ruins, and take a dip in the cool Caribbean waters that line the ruin’s beautiful beaches. Watch out for sea turtles, and their nests along the protected beaches of Tulum. If you are looking for a bohemian style vacation with plenty of sun, sand, and sea then Tulum beach is the perfect destination for your next trip. There are a number of rustic beachside eco-resorts and boutique hotels situated along Beach Road in Tulum which has consistently been ranked as the best beach in Mexico year after year, and eco-tourism is extremely popular in this region. You will not find your typical big box hotels, all-inclusive resorts, or chain restaurants on Beach Road. Also missing from the famous Beach Road landscape are the atrocious site of power lines. In Tulum Beach, you will find none. With the removal of the modern conveniences annoyances like telephones, televisions, and internet connections comes a peacefulness that is welcomed with open arms. When is the last time you were able to carry on a conversation with your friends or significant others that didn’t involve background noise of some kind? In Tulum, you will find yourself easily falling asleep to the rocking of the ocean waves as they crash onto Tulum’s beaches or the relaxing sounds of the nature that surrounds you. Accommodations in this boho-chic region range from $40 – $400+ (USD) per night. You can have your pick of anything from beachside cabanas to suites. If you are lucky, whatever accommodations you select will feature ample mosquito netting. You are in the jungle after all! 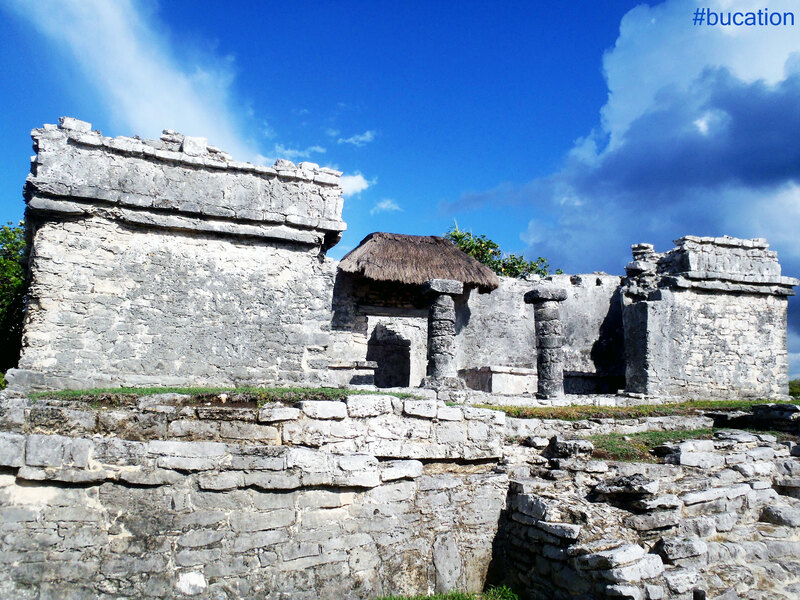 Tulum Pueblo – This is known as the town of Tulum, and it is just a short drive from Tulum ruins or Tulum beach. Many of the local employees of Tulum Beach hotels reside in Tulum Pueblo. The main highway, Route 307, runs right through Tulum Pueblo where it becomes Avenue Tulum. Parallel to Avenue Tulum, but separated by landscaped dividers, are one-way roads paved in cobblestones with ample public parking. 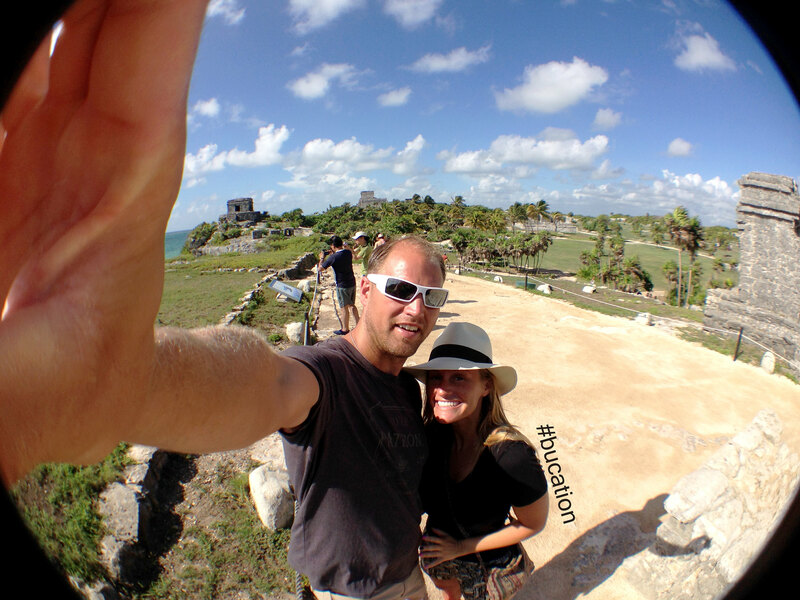 In Tulum Pueblo you will find a number of restaurants, banks, tourist and local shops, and numerous businesses. 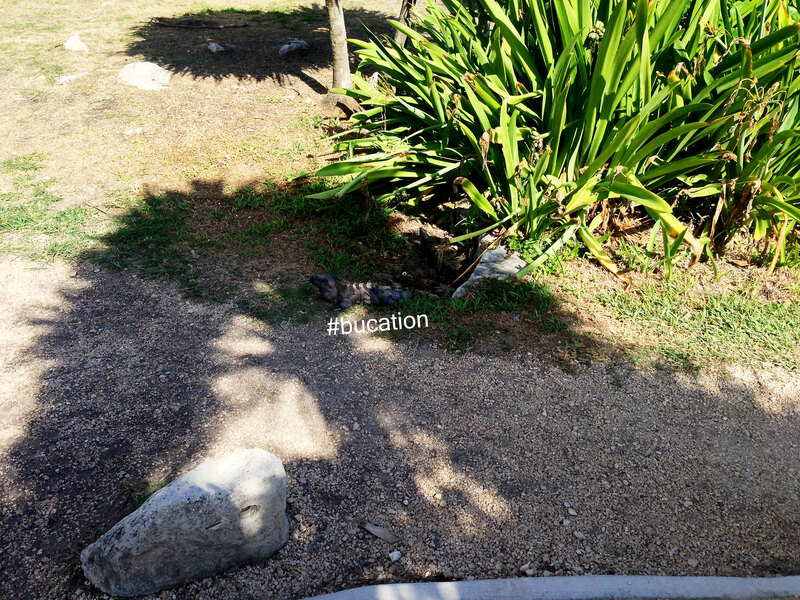 Venture off Main Street and you will find residences, schools and parks. You will also see that the Mayan culture is still prominent in this area. There are a number of restaurants and internet cafes in Tulum Pueblo which are closely concentrated north of the town’s center. You will find a more diverse variety of cuisine in Tulum Pueblo, and the shops offer an excellent selection of souvenirs. El Mariachi offers open-air curbside dining in Tulum Pueblo which is the perfect spot for people watching. The restaurant is nothing fancy, but the service is extremely friendly and the tacos are fantastic. El Mariachi also offers a number of flat-screen televisions where you can view popular sporting events. We love the fresh chips and salsa, the Tacos de Pastor, and the slow-cooked pork enchiladas. 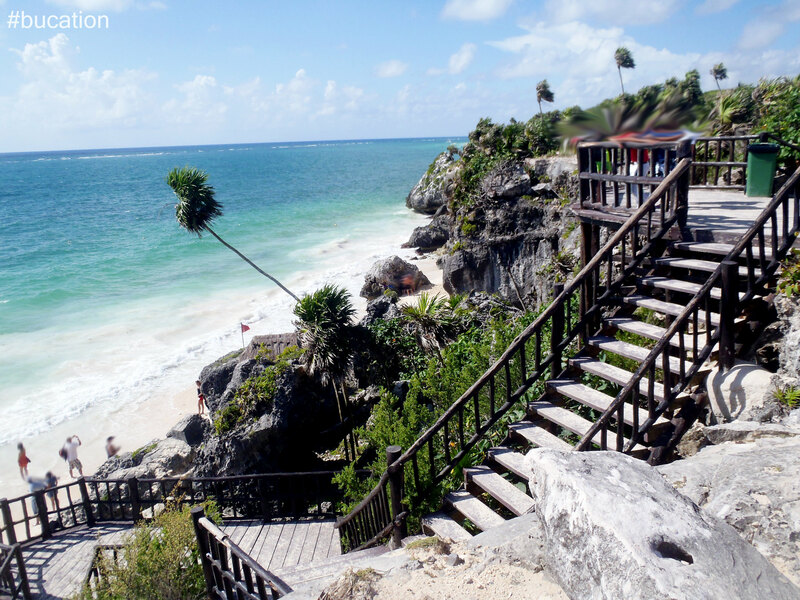 Tulum Beach – Just south of the Mayan ruins you will find a scenic coastal road that is sprinkled with bohemian hotels, restaurants, and shops. As you make the trip down Beach Road, you begin to realize you are driving the divide that separates the Jungle from the Sea. Seafood is the cuisine de locale, and a number of establishments offer nightly entertainment from local musicians. La Zebra features authentic local cuisine overlooking the muti-hued Caribbean Sea. We recommend a table directly on the beach, and the Chile Capón de Camarón. At Le Zebra you will enjoy dinner by moonlight and authentic local cuisine that you will never forget. Mateos open-air two-story barbecue boasts”world famous fish tacos,” but there is no shortage of delicious items on their menu. From fajitas sizzling full of flavors to delicious kabobs, we highly recommend this popular jungle-side venue for your next meal in Tulum. We love the magnificent views high atop the restaurant’s Sunset Lounge along with the Mexican sampler platter and of course, the Baja style fish tacos. 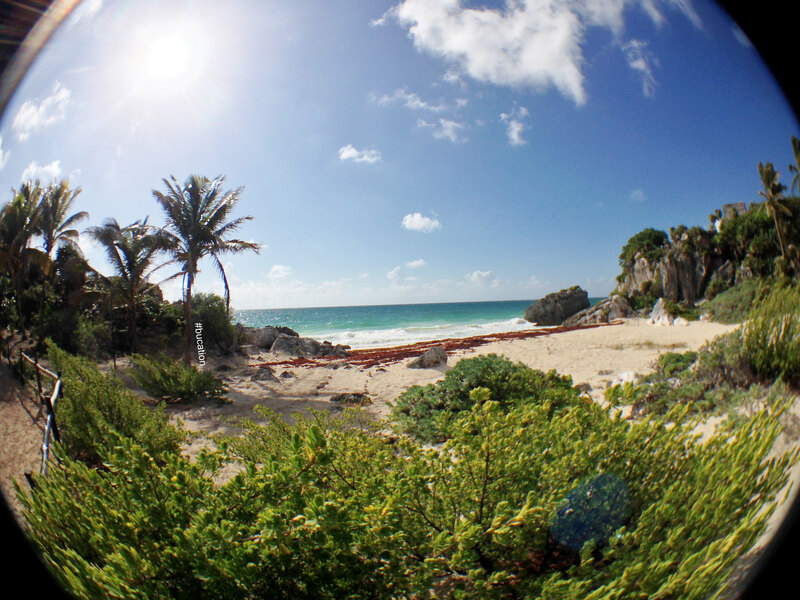 If you ask us, the climate in Tulum is practically perfect all year long. Hurricanes and tropical storms are not common for Tulum, and the temperatures average around eighty degrees fahrenheit throughout the year. The “Dry” season in Tulum is said to be from November through May with a few quick moving storms passing through Tulum’s beaches in the blink of an eye. The remaining months of the year (June through November) are considered the “Wet” season in Tulum. We were told by our hosts in Tulum that they see the most rain during the months of July and August and during this time of the year when it does in fact rain, it pours! We split our time in Tulum between the months of August and September. Sure enough we found this to be true. One sunny August day, while we were unwinding on the beach with a freshly squeezed mango margarita from our hotel bar (side note: we still dream about those margaritas today) a massive storm cloud rolled through the white sand beaches and unloaded buckets of rain as we ran for cover. A number of visitors choose to book an organized tour through their travel agent or their resort in Cancun to visit Tulum. These organized full day tours include transportation, admission, and a tour guide for one set price per person. However, we highly recommend you make the trip yourself, whether by rental car or ADO public transportation (side note: the ADO is fantastic! 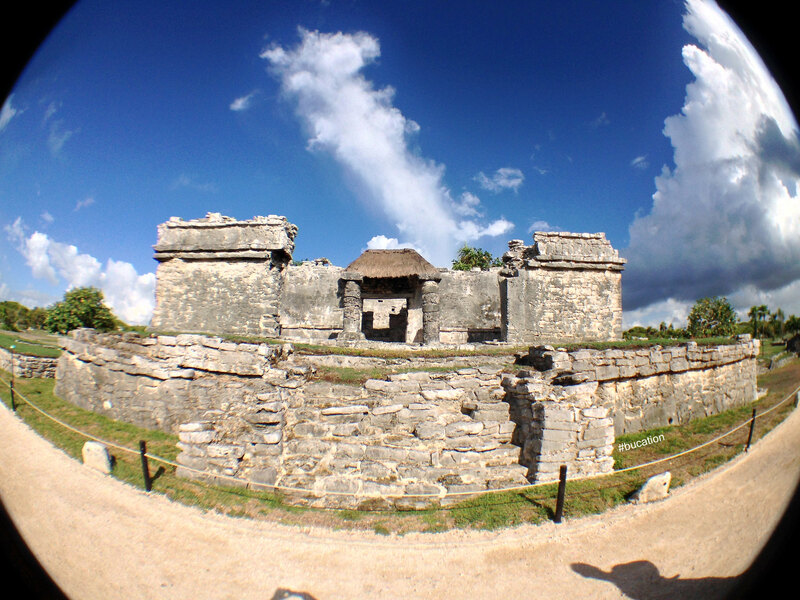 ), to make the most of your time in the enchanting region of Tulum. 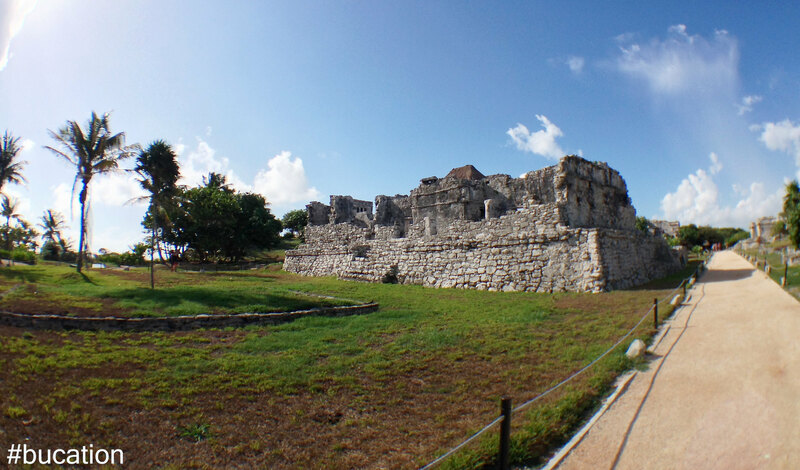 The Mayan ruins of Tulum are an easy drive from Cancun International Airport. It took us a little over an hour and a half to drive South on Route 307 from Cancun International Airport, where we picked up our rental car, to the pueblo of Tulum. The main entrance to the ruins themselves is located just before the intersection of Route 109 and Route 307, and there is ample parking. 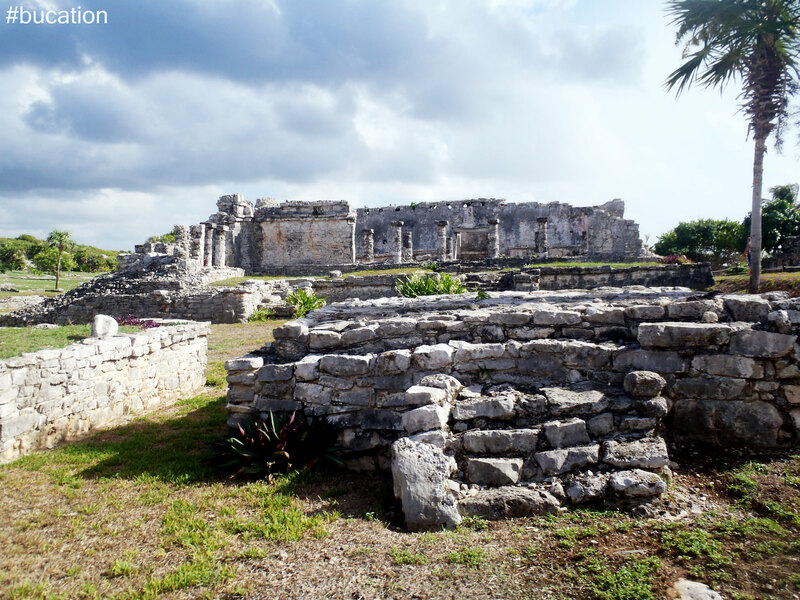 If you already have accommodations in the Tulum area, the ruins are easily accessible by car, taxi, bicycle, or from a short walk from many of the hotels located on Beach Road (Route 15). 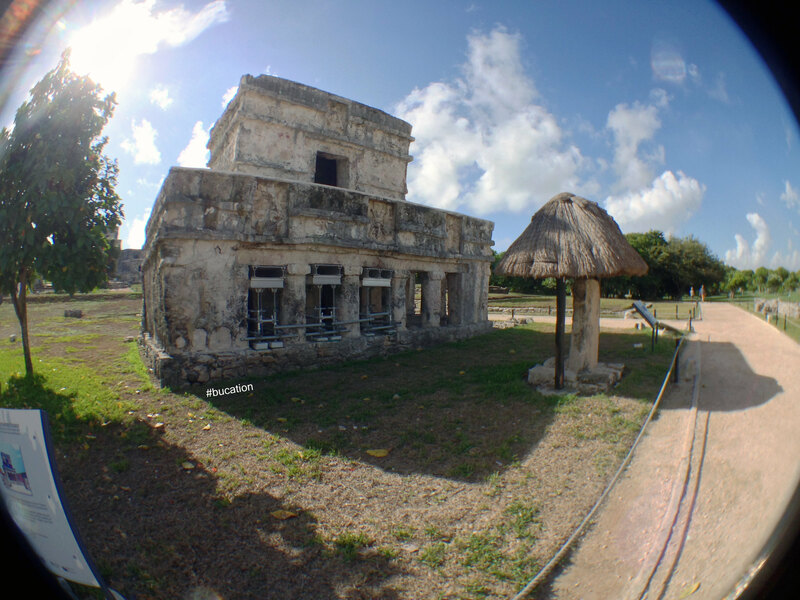 We were fortunate enough to have our own rental car with us in Tulum, and we decided to park near the southern Watch Tower Temple Gate which also serves as an exit in contrast to the busier and far more congested Visitors Center. 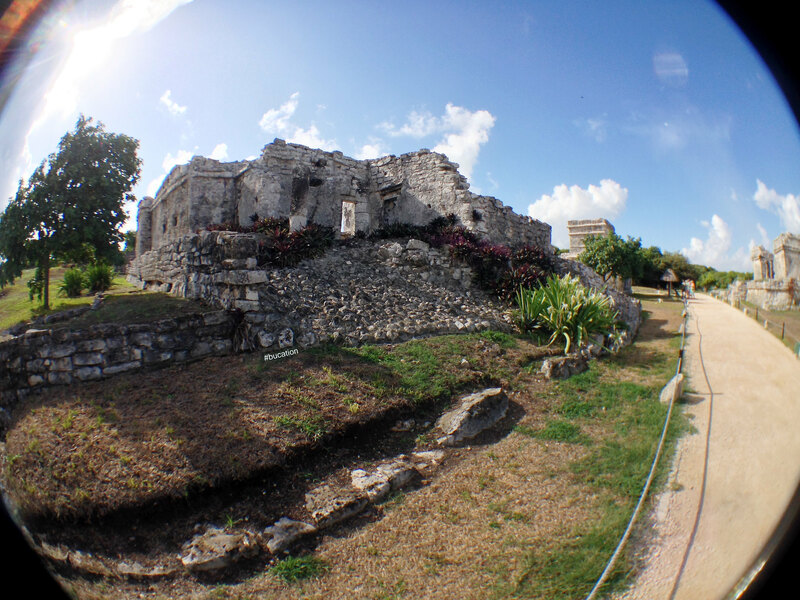 Whether you plan a day trip or an overnight stay in Tulum, this area rich in history and culture is not to be missed. 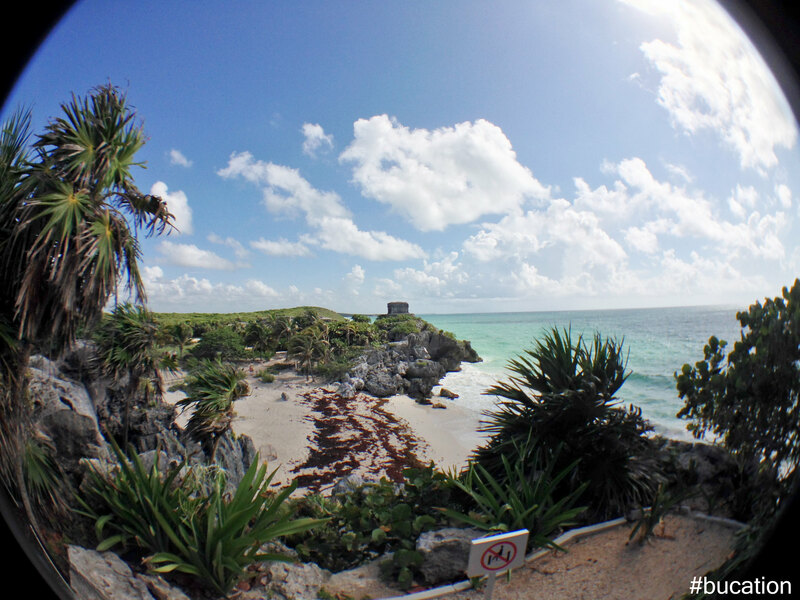 Ever since our visit to Tulum, we can safely say there is nothing else on earth like it. They say a picture is worth a thousand words, but we recommend you experience all of Tulum first hand as photographs simply can not do justice to this magical region. Have you had the chance to visit, are you planning an upcoming trip to Tulum, or have you visited another of the Yucatan’s ancient archaeological sites? We’d love to hear about your experiences and plans.